Zion Research has published a new report titled “Residential Air Purifiers Market (HEPA, Ion and Ozone Generators, Electrostatic Precipitators and Others): U.S. Industry Perspective, Comprehensive Analysis, Size, Share, Growth, Segment, Trends and Forecast, 2015 – 2021”. 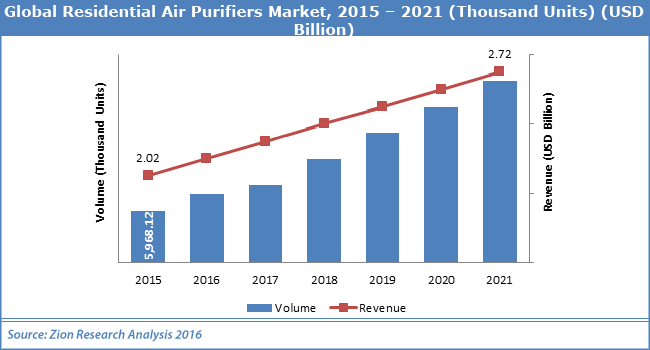 According to the report, the U.S. residential air purifiers market was valued at approximately USD 2.02 billion in 2015 and is expected to reach approximately USD 2.72 billion by 2021, growing at a CAGR of around 5.07% between 2016 and 2021. An air purifier is a device based on advance technology used to purify the indoor air and remove unwanted dust and microbes. Residential air purifiers absorb and decompose different air pollutants such as allergens, decoration pollution PM2.5, odors, bacteria, and dust among others. Most common types of air purifier typically contain a filtering material, sealant, frame, faceguard, and gasket. Different type of air purifiers includes high-efficiency particulate air (HEPA), ion and ozone generators, electrostatic purifiers, UV technology, activated carbon technology among others. The residential air purifiers market is expected to witness significant growth due to the increasing air pollution and health-related issues such as asthma and allergies. The major driving factor for residential air purifiers market is increasing disposable income in U.S. that simultaneously increases the demand of luxurious lifestyle. In addition, the demand from growing construction activities is expected to have a positive impact on residential air purifiers market. The high demand of low range residential air purifiers from price conscious people is also expected to develop a potential growth in key players of this market. Product innovations and vertical integration to improve affordability is likely to open new market avenues in the near future. However, some restraints like low profit margins due to augmented competition and volatile prices of raw materials used in manufacturing of residential air purifiers may hamper the growth of this market. On the basis of types, the U.S. residential air purifiers market is divided into HEPA, Ion and ozone generators, electrostatic precipitators and others. The different types of air purifiers are categorized based on the technologies used in their manufacturing. HEPA was a major type segment of residential air purifiers market and constituted 44.72% share of the U.S. demand in 2015. It is expected to continue its dominance in U.S. market over the forecast period due to the high effectiveness of trapping airborne particles and widespread adoption in residential applications. Electrostatic precipitators are the second largest type segment of the residential air purifiers market. The U.S. residential air purifier market is segmented into four major regions includes South, West, Midwest and Northeast. The demand for residential air purifier was highest in South region accounted for 39.56% of the total market share in 2015. Key industry participants include Austin Air, Blueair, Honeywell, IQAir, and Sharp among others.